White tea is the uncured and unoxidized tea leaf. Like green, oolong, puerh, and black tea, white tea comes from the Camellia sinensis plant. Only the buds and young leaves covered in short white hairs are used. To produce white tea only two steps are taken: steaming and drying. The leaves are unaltered because they are not withered in the sun, rolled, or oxidized as are most other teas. 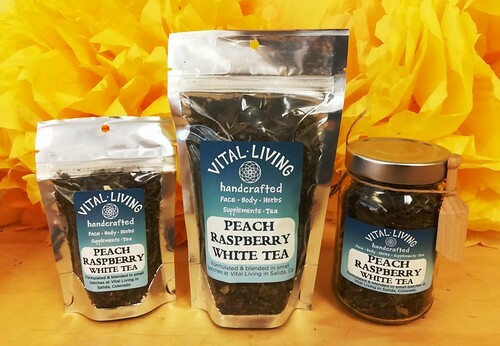 White tea produces a very mild and refreshing infusion that is very light in color, and is generally lower in caffeine than all of the other categories of tea. Many studies have proven a multitude of health benefits using green tea but white tea may contain more polyphenols than green tea due to less processing. A cup of white tea contains approximately 15 milligrams of caffeine. This tea is one of the famous white teas from the Fujian area of China. The multi-sized brownish-green leaves are produced from the naturally withered upper leaf and tips and brew a wonderfully refreshing, light taste in a white tea, then we think you will enjoy this one. Brew 2 tsp per cup or pot at 195°-205° and steep for 2-5 minutes. 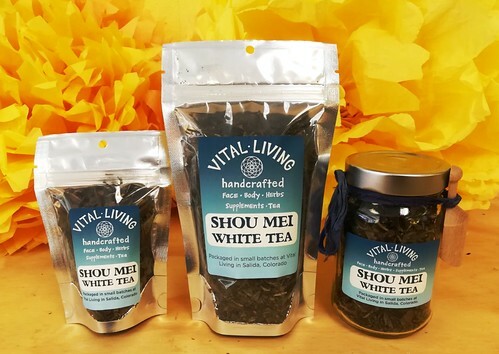 Shou Mei white tea and all natural peach and raspberry flavor intermingle to produce one of the loveliest teas we offer. Light and refreshing, and absolutely divine over ice! !